Capone gets small to visit the set of Marvel's ANT-MAN, Part 1!!! Last October, I did something I’d never done before. I went to my first set visit for a Marvel Studios film. In this case, it was the ANT-MAN set at the new Pinewood Studios-Atlanta (or should that be Ant-lanta? Get it? Moving on…). At the time, there were only six soundstage completed, and all were being used for ANT-MAN, the first film to shoot there. It’s my understanding that presently the property no has upwards of 20 stages operating, many of which are currently in use as shooting for CAPTAIN AMERICA: CIVIL WAR is fully under way. A couple of things I noticed as we pulled into the lot. The code name being used for the production was “BIGFOOT” and the fake production company name on some documents I saw was “Pym Productions.” The two days I spent on set were days 37 and 38 of 75, which seemed relatively short for a film of this scope. Like many of you, I’ve been particularly excited about ANT-MAN coming to fruition for nearly 10 years, even before Marvel Studios exploded with films like IRON-MAN and the THE AVENGERS. And while I was certain eager to see what original screenwriter (with Joe Cornish) and director Edgar Wright had in store for their story that incorporated their incarnations of Hank Pym (a founding member of the comic book Avengers) and Scott Lang, I was actually more interesting in the film because of conversations I’d had with Wright about the film a couple years before he left the project over vaguely explained creative differences. 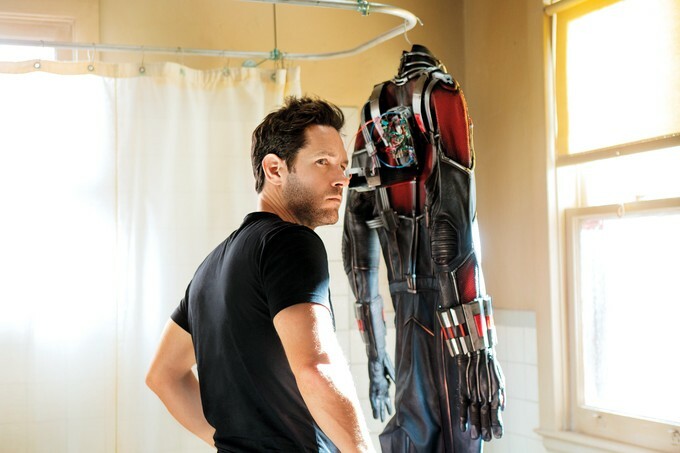 Scott Lang is the closest thing to a normal guy the Marvel cinematic universe has had to date. He has no superpowers or enhanced abilities without the suit, he’s not filthy rich (quite the opposite), nor is one of the smartest guys in the world (although he does, as I found out, have a PhD in electrical engineering). He’s an ex-con with an ex-wife and a young daughter who barely knows him. He hangs with a seedy element, including his former criminal partner in crime Luis (Michael Peña), two of his co-horts, played by T.I. and David Dastmalchian. So in essence, Lang’s journey is the audience’s journey; this is all new to him; he was not fated to become a superhero because he has the natural tendencies of a heroic figure. 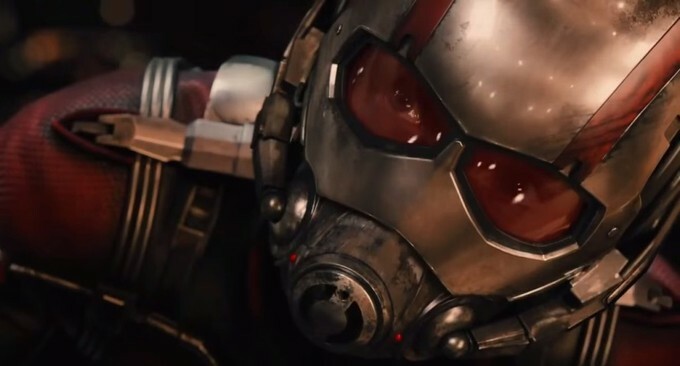 And while it appears from photos leaked from the set of CIVIL WAR that Ant-Man is fighting alongside members of the Avengers—a team whose members Lang greatly admires—the ANT-MAN film is about how, by barely grazing a part of the world where the Avengers exist, Lang is somehow pulled into their ranks, likely by the end of this film. Lang is a is a hero built from the ground up, and that’s a journey I’m interested in taking. Whether new director Peyton Reed and his team succeed remains to be seen. But between a genuinely cool and informative Octoberset visit and a more recent edit-bay visit a couple of weeks ago, I have reason to at least be optimistic about ANT-MAN. Unlike Paul Rudd (playing Lang), who is wearing a full costume in every scene, Stoll’s entire Yellowjacket costumer is CG, so when we see him later in this scene, he’s got a s motion-capture suit on with dots applied liberally. 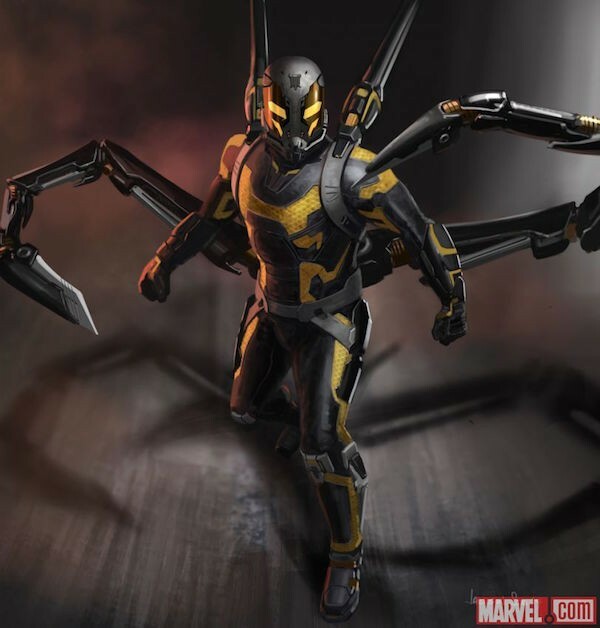 But it seems clear by the way he stands up, chest puffed out, that this sequence is likely the first reveal of the full Yellowjacket costume, which we are only shown via a pre-viz look at the whole fight by none other than Kevin Feige, head of Marvel Studios (more on that later). In this particular bit of filming, Stoll is still wearing a business suit as he’s yelling at an unseen Ant-man. When we’re able to glimpse the helicopter set, we can see that it’s mounted on a gimbal of sorts that allows it to rock back and forth, with blue screens in the background where aerial images will be placed later. While hearing Stoll deliver slight variations on his lines—some more angry, some more desperate—we can hear someone off camera shouting lines at him, presumably a shrunken Ant-Man taunting him. It’s tough to hear these muted lines, since the person shouting them isn’t mic’d, but at one point I do here the line: “It’s not a heist; it’s a demolition,” at which point Stoll turns to a widow in the helicopter to see something…destructive. At various points, Stoll is also using a gun and shooting at an unseen target (three guesses who), and he is told by someone that he is blinking too much when he shoots, which he acknowledges and immediately corrects. At this still-early part of the day, the group of online writers I’m with are taken to the complex’s main offices where we sit down with Feige, so he can show us the full pre-viz sequences that is being shot. It’s clear that a bad guy is trying to escape and Ant-Man is trying to stop him, which leads to a great Ant-Man vs. Yellowjacket fight sequence inside a locked briefcase. Consider that for a second: two tiny people battling is out within a fairly cluttered suitcase, dodging pens, documents, various electronics. Feige submitting himself to a fairly lengthy interview by us at this point, which I’ll post for you separately and soon, but one thing he did mention is that we should expect Hank Pym’s wife Janet to be somehow represented in this story (likely in a flashback). Again, more on that soon. We are then ushered in to the costume shop, where various version of the Ant-Man suit are on display. This is our first time actually seeing the suit and helmet. We are taken through ever feature and function of the suit, from the retractable face piece to the tubes that run the length of the suit, presumably to deliver the Pym Particle, which makes shrinking possible. We’re told that for every version of the suit that is made for Rudd, another identical one has to be made for his stunt double. Some of the suits are made to look distressed and battle worn, and it’s at this point that we are told that the suit looks deliberately retro, since Lang is wearing Pym’s suit from several decades earlier. This is not a modified or updated costume; it’s Pym’s original. 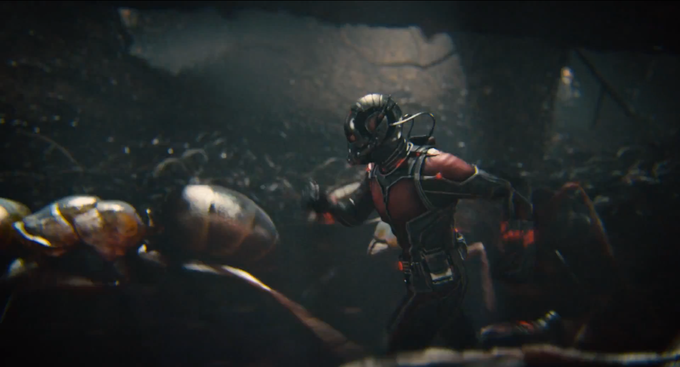 (My understanding is that that Ant-Man suit seen on the CIVIL WAR set is a bit more modern.) It’s high-tech, but for its time. Except for the thin tubes and helmet, the whole suit is clearly a metallic-looking fabric that is also flexible, meant to look functional and designed for a specific purpose, which is not military, meaning it doesn’t have weapons, unlike the Yellowjacket suit, which is loaded with all sorts of guns and beams and things that go boom. The helmet is particularly interesting because many of its pieces (54 in all) were made in a 3-D printer, and we can see how the visor has a reflective quality. The 3-D printing is significant because it makes it easier to replace individual pieces if they break, rather than the entire helmet. Naturally, any prototype costumer elements and destroyed, so we can’t steal them. When the faceplate is down, there’s a device that covers the mouth, which I’m guessing is either for communicating with ants or for amplifying Lang’s voice when he small, so normal-sized people can hear him. We are shown a few photos of Rudd in the costume, as well as other production designs for the outfit, and then we notice that the stuntman’s outfit is actually made entirely of rubber to handle physical abuse. 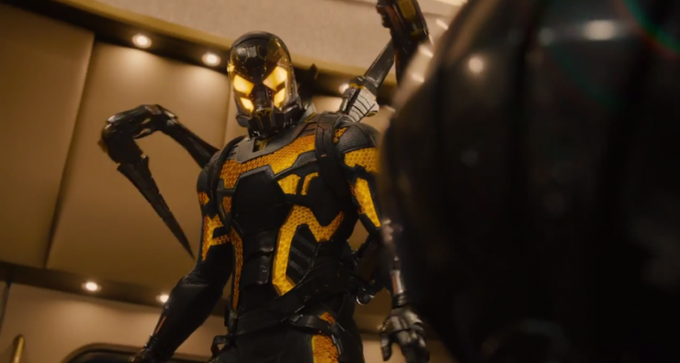 We are also shown designs for the Yellowjacket costume, which still need to be designed for the motion-capture team. The look is harder, nastier, and the extra limbs attached to Cross’ back appear especially capable of delivering pain. For both costumes, the designers said they looked at both the comic book version of these costumes as well as nature docs and video, just to get a sense of movement and composition. Thirteen different suits have been made, to be used depending on the scene. 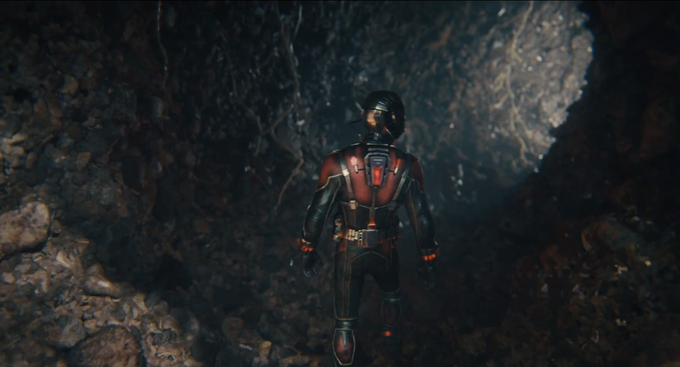 There’s also a small backpack on the suit that is probably some kind of power supply, and we notice small buttons built into the gloves that deliver trigger Ant-Man to shrink. We make a quick trip back to watch more helicopter shooting, this time it’s a reverse shot inside where we see there are a couple of Cross’ henchmen in the plane as well. 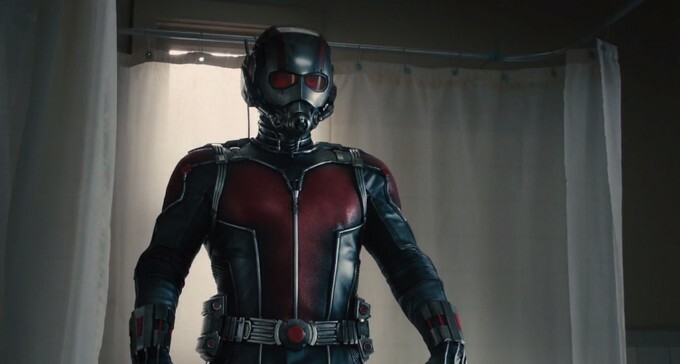 Obviously we still can’t see Ant-Man, but we can see how he’s flying around the room and just generally wailing on these suits, as parts of their jackets and ties fly up on the air as if a tiny person is moving around toward their faces to punch them. At this point, Rudd himself comes into the room in civilian clothes to chat with us. As I said, I’ll feature the complete interviews done during this visit in separate posts in the weeks leading up to ANT-MAN’s release on July 17. Perhaps the most inventive part of ANT-MAN will be Reed’s insistence on using as many practical sets as possible, rather than creating CG environments for his tiny characters. We were next taken to what was described to us as Macro-sets, real-size sets that are explored in minute detail using special cameras and lenses that will bring us down to Ant-Man’s size. We see samples of scenes that explore the inside of an ATM, a bathtub (which you may have seen in the trailer), and a kitchen floor. There’s one sequence that shows a teacup and you can see the rough texture of the cup, In another scene, dust is quite clear and large. We’ll go inside pipes, air ducts, and even a vacuum cleaner. No oversized props were used, we were told. 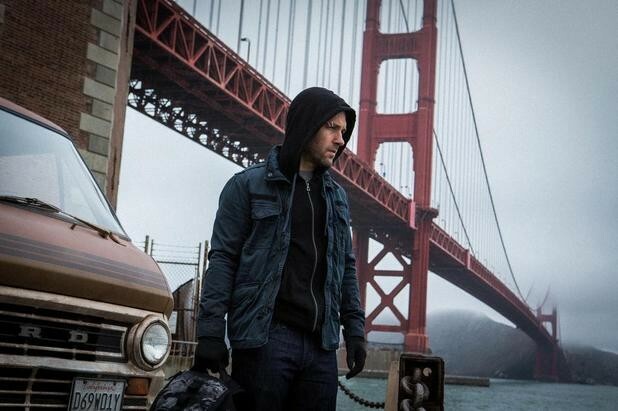 And the only special effect in these scenes is Ant-Man superimposed onto these backdrops. I’ve seen a finished sequence in which Lang first learns to get small and he falls down a bathtub drain, which takes him to so many other places. It’s spectacular. We head back to set to catch our first glimpse (on video monitors) of Rudd in costume. He’s hanging out of the side of the helicopter at full size, clinging to a seat belt for dear life. The helmet reveals that his eyes are visible (presumably to be cover over in red lenses in the final film). After he’s done with the scene, Rudd joins us again, this time in full costume, and we get our first clear look at how he wears the suit. I’ve seen Rudd several times in person over the years (although this is the first time I’ve seen him working on set), and it’s clear that he’s slimmed down but also added muscle to his arms and shoulders. Another difference between Lang and the other Marvel movie heroes will be that he’s not ripped like a Roman gladiator on steroids, so I don’t know for sure if he’ll be features without a shirt on at any point in the film. Back to filming, this is when we see Stoll in his black-and-yellow mo-cap suit for the first time, puffing his chest out as he rises up, like a true villain would. Even without being able to see Ant-Man, the filming makes it pretty clear not just where he’ll be in the space, but when he’ll be shrinking quickly to avoid getting his by these energy beams being shot at him. One of the coolest moments in this shooting involves the special effects team coming in after the shot is done with a maquette of the Yellowjacket suit (including the helmet and extra appendages) on a pole as a visual effect reference, capturing how the light will cast shadows and reflect off of the suit. It’s the closest we get to seeing Stoll in costume all day.